Shannon Hargrave: 21 Day Fix Extreme! <~~~ NEW!!! 21 Day Fix Extreme! <~~~ NEW!!! IT'S TIME TO GET SERIOUSLY SHREDDED! That's why it became America's #1 fitness and nutrition program. Now, celebrity trainer and national bikini competitor Autumn Calabrese is going to ramp up the intensity to help you shred up and shed off those final pounds…with 21 DAY FIX EXTREME. For your nutrition, you’ll not only be practicing portion control—you'll be eating ONLY clean foods. No treats. No cheats. No excuses. It’s 21 days, and it’s extreme. But if you want a lean six-pack, cut arms, ripped shoulders, and toned legs…it’s time to get serious! The 21 Day Fix is different from any other Beachbody program released in the past. It is a full featured workout program accompanied by a thorough weight loss plan as well. One of the unique features of this program is that it involves no counting of any kind. That means you will not need to worry about fat content, carbohydrate count or calorie amount in the foods you consume on the plan. There is no measuring and no wondering how much you can eat or how often. On the 21 Day Fix, no food is prohibited either. But, by far, the most appealing feature that many cannot seem to pass up is the promise that you can lose up to 15 pounds in only 21 days. 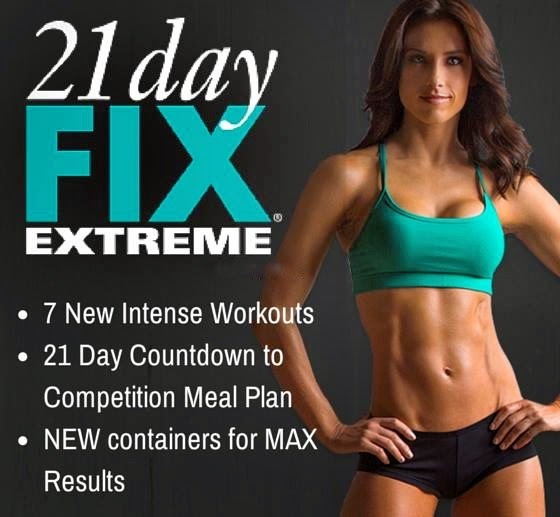 The 21 Day Fix was created by Beachbody’s newest trainer, Autumn Calabrese. Autumn is a fitness competitor and certified personal trainer. She has trained countless celebrities, including famous star stylist Rachel Zoe and Dancing with the Stars hosts, Tom Bergeron and Brooke Burke. In the program, she shares her knowledge and passion for fitness in order to help others change their life for the better. Autumn designed the program with the intention of teaching users about fitness, portion control and most importantly, how to build life-long healthy habits. In the 21 Day Fix, Amber teaches what proper portion size looks like by using color coded food storage containers to help plan out your meals for each day on the plan. She also created six different workouts in order for you to get the most out of your exercise routine with short, intense bouts of exercise for each day of the week. With each workout video being only about 30 minutes long, they are easy to fit into your day regardless of how busy your schedule may seem. The workout videos are so easy to follow and include basic exercises most people are familiar. If you are a parent that has to workout at home, you can even have your children join you and do the workouts with you. It is never too early to introduce them to fitness and healthy eating. The 21 Day Fix program comes with six workouts on two DVDs plus the bonus workout, the Dirty 30. The workouts are only about 30 minutes long and are ideal for anyone that leads a busy lifestyle and/or has little time to squeeze in a workout due to family or work demands. The only equipment necessary to complete the workouts is a variety of small free weights and a resistance band. Some workouts can also be done with your own body weight and will require nothing but a workout mat. The program is as basic as it gets, but the results that you can achieve in only three weeks are far beyond basic. Although the workouts are short, they are intense and will leave you feeling the burn for days. If you have limitations due to an injury or other ailment, there are modifiers in every workout that appear on screen to help you town down the intensity and the impact on your body without sacrificing calorie burn. On the 21 Day Fix, you can expect to do a work out each day of the week but, since each is only 30 minutes long, it is easy to complete either before work, during your lunch break or in the evening before bed. Throughout the 21 days on the program, you will repeat the DVDs for three weeks. Once you receive the 21 Day Fix and have your containers, all you need to do is fill it with delicious, healthy food and eat what you can fit into them. There is no need to worry about fat, calories, carbohydrates, sugar content or any other number for that matter. It could not be easier, especially for someone that is new to weight loss and/or does not want to have to worry about keeping track of how much they have eaten. The eating plan even includes a restaurant guide so you can plan ahead before heading out to dinner with friends and remain on the plan without cheating. In order to help keep you within a healthy calorie range without counting them, the 21 Day Fix nutritional plan comes with a chart and mathematical equation to help you determine how many servings of each of the seven containers you should be eating per day. Since calorie intake differs for everyone depending on gender, stature and activity level, you will be required to use the equation and chart in order to figure out how much to eat in order to reach your desired goal weight. If you happen to be on a special diet, such as vegetarian, diabetic, breastfeeding or any other, the 21 Day Fix nutritional plan can be adapted to meet your specific dietary needs. The containers and plan can be modified, and instructions to do so depending on your specific diet are included in the program. Think about the 3 Day Quick Fix as an accelerated kick start to your weight loss on the 21 Day Fix plan. It will help you shed the maximum amount of weight that is healthy for your body type and frame in as little as 72 hours. The 3 Day Quick Fix is what its’ creator, Autumn Calabrese, uses in order to prepare for a fitness competition or magazine photo shoot. The 3 Day Quick Fix can be done in the beginning of the plan and/or at the end for even more incredible results. If you want to lose weight quickly, this is one program that is capable of delivering that. There are two approaches you can take when embarking on the 21 Day Fix, and the path you choose will depend on how much weight you have to lose. If you have a substantial amount of weight to lose, you can easily lose 15 pounds in 21 days as promised by the program. As long as you follow the exercise plan and eat only what you can fit into the containers, your weight will come off. The longer you remain on the program, the more weight you will lose. You can have one cheat meal per week as stated in the nutrition plan, but it is important not to over indulge. If you only have a small amount to lose and are basically using the 21 Day Fix to lose your last 10 to 15 pounds before summer, you can realistically expect to lose up to 10 pounds in the three weeks on the plan and gradually lose the rest if you continue. If you wish to do the plan long term and lose a lot of weight over an extended period of time, you can repeat the program as many times as you want in order to achieve your desired weight loss. Once you are accustomed to how much you should be eating each day, you can simply use the containers daily and incorporate different workouts and fitness routines from other Beachbody programs to avoid boredom. The goal of the 21 Day Fix is not to be a temporary diet that you stay on until your weight comes off. When Autumn created the plan, she did so because she wanted to teach others healthy eating habits. America has a major problem with portion control and, by doing the 21 Day Fix; you can relearn what a proper sized meal should look like. What is Included in the 21 Day Fix Program? The Lower Fix workout focuses on the lower body, with a special focus on most women’s problem areas, the legs and buttocks. Once again, you will be doing two rounds of exercises with a rest period in between that is 20 seconds long. Everything from your calves to your buttocks will be sore after completing this 30 minute workout. What Can I Expect From the 21 Day Fix Program? Minimal equipment is needed to complete the workouts. Short, 30 minute workouts are easier to fit into a busy schedule that longer gym or outdoor workouts. There are modifications in all of the workout videos for those with limitations now allowing them to perform at full potential. You will probably need additional containers and they can be pricey. Warm up & cool down periods in workout videos are very short and seem insufficient. *****BEST DEAL CHALLENGE PACK***** 21 Day Fix Extreme Challenge Pack. The 21 Day Fix Extreme Challenge Pack includes all of the items that come with the Basic 21 Day Fix Extreme Kit plus a 30 day supply of Shakeology in the flavor of your choice. Since Shakeology is included in the 21 Day Fix Extreme Meal Plan, it is a good option to have on hand while doing the program. It will help add variety to your diet and some even use it as a dessert treat. The cost of the Challenge Pack is $160 and shipping is only $2.00. ***NEXT BEST DEAL*** Everything above minus the 3 Day Refresh. The 21 Day Fix Essential Kit. It costs $59.85 plus $13.95 shipping and handling. It includes six workouts on two DVDs, six food storage containers and a shaker cup. In addition, Beachbody is also including four free bonus gifts to supplement the plan. You will also receive the 21 Day Fix Eating Plan, the 3-day Quick Fix guide, the Dirty 30 bonus workout and Beachbody’s 24/7 online support when you order any of the three packages available. The Ultimate 21 Day Fix Kit. The Ultimate package comes with everything included in the Essential 21 Day Kit, plus an insulated bag to store your food in at work or while on outings, two additional workouts, a large on-the-go container and a resistance band. The two additional workouts are Flat Abs Fix and Barre Legs. They can be done in addition to the six workout videos already included with the program in order to turn up the intensity throughout the week. 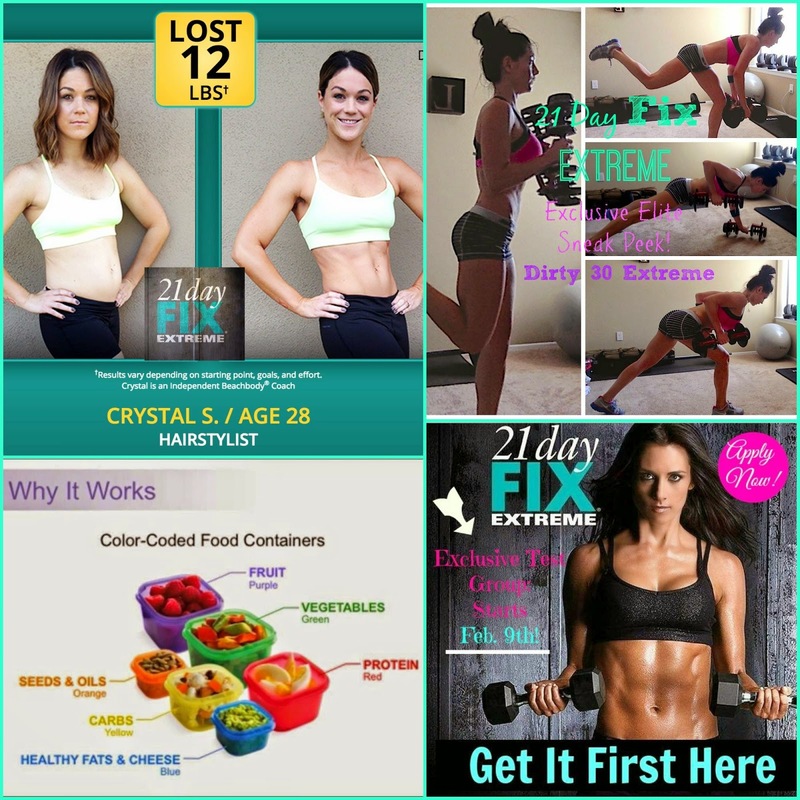 21 Day Fix & 21 Day Fix Extreme COMBO Pack!!! The resistance band is a 15 pound Pro-Grade band that you can utilize while doing your 21 Day Fix daily workouts. The plan suggests using free weights but, if you are just starting out with a fitness routine and do not have weights handy, you can incorporate the resistance band to get started. Once you feel comfortable enough that you will continue with the plan and have increased your strength, you can add free weights as well. The on-the-go container given with the 21 Day Fix as an additional gift makes it easy to take your food storage containers while on the road for work or pleasure. The Ultimate 21 Day Fix costs $119.70. You can also purchase the two additional Ultimate DVD workouts, Flat Abs Fix and Barre Legs individually and add it to the Basic 21 Day Fix Kit or Challenge Pack for $29.85 if you wish. Some additional items you can purchase to go along with your 21 Day Fix program are an extra set of food storage containers and a Plyo Fix Workout to add to your 21 Day Fix workout DVDs. It is a good idea to have an extra set of food containers for advanced meal planning and food preparation. Since you will be eating more than one of each container filled with food each day, it can be difficult to eat out of it, wash it and refill it if you spend most of your day at work or out running errands. Having at least two to three sets of the containers will allow you to plan your meals ahead of time and have them ready for the remainder of the day. You can also plan your meals prior to the work week beginning and store it all in the containers for a few days at a time. By doing this you will be less likely to cheat and deviate from the 21 Day Fix eating plan. A seven piece set of extra containers costs $17.85 so planning ahead for the week will mean spending more money on containers but it can be very helpful in ensuring you stick to the plan. I will be hosting an EXCLUSIVE 21 Day Fix Extreme Test Group where I will be mentoring you through the program, teaching you how to use the nutrition plan, create a meal plan, prep, as well as give you snack ideas, recipes, and tips. Plus you will get daily motivation and accountability from me in a closed online group!!! Does this sound like something you would like to do? If so, complete the application below to be considered for a spot in my exclusive test group!!!! Fill out the Application below to put your name on the list to get this program FIRST!